It's a girl! It's a girl! 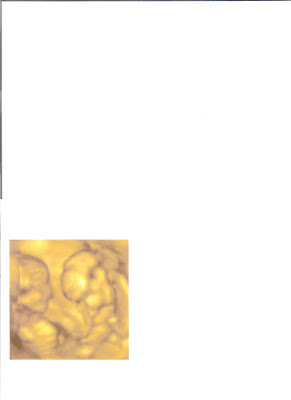 This week we went and had a 3-D ultrasound done of the twins! It was so much fun to watch them move around and kick and hit at each other! We discovered during this ultrasound that we are having 2 girls!!!! Excitement can not begin to describe how we feel about this news!! Landon is glad that we are having 2 girls as well, but says they have to wear blue not pink! This picture didn't scan all that well, but hopefully you can get the gist of the two of their heads looking at each other. The one on the left is smiling and the one on the right is covering her face with one of her hands. Kyle says it looks like they are playing peek-a-boo! Today my friend Heather and I took the kids to Funworks to play on their inside jungle gym since it was a rainy cloudy day. Cady and Landon had a lot of fun playing together and especially liked the walk we took around the mini-golf course. It was so cute watching them hold hands and play together. Afterwards we took them to McDonalds for lunch- it was a perfect day for a two-year old! Last night we had some friends over for dinner and let the kids color Easter Eggs together. It was so much fun and the boys had a blast playing with the eggs in the dye. Landon's hands are still blue and green today! It was a great evening!